I take pictures of road signs all the time! As we travel around the world, I think it is really interesting to see how other communities express themselves through their signage.... and from all the countries I have been to, I can promise you that you learn A LOT about a city just from its street signs. 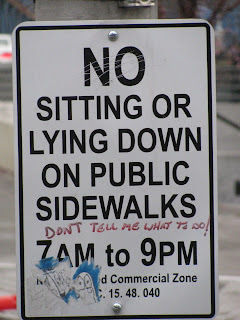 This sign was one that I found not too long ago and as I took the picture, I really wanted to stop a passerby and ask him what on earth had been going on in this area, on this particular sidewalk between the hours of 7am and 9pm to warrant such a sign. As Paul Harvey used to say, I needed the REST OF THE STORY! Since I was with a friend on a tour, I did not feel like I could just hang out and quiz people, so instead I was forced to leave it up to my imagination. 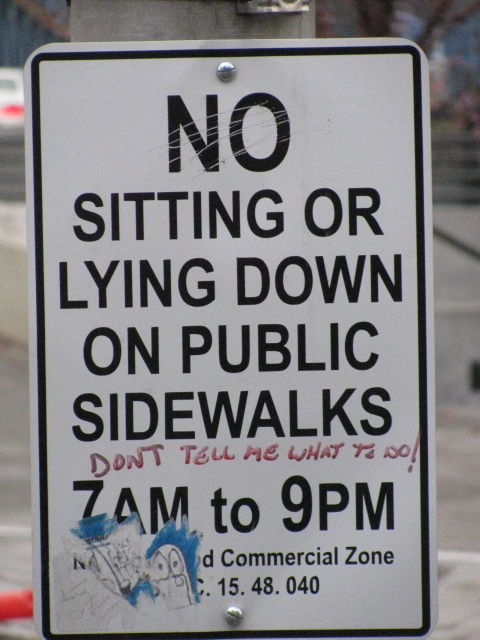 So what do YOU think was happening on THIS public sidewalk as well as others between 7am and 9pm each day PRE-Sign????? As much as I hate to say it, I'm guessing it was either beggars sitting and begging or the homeless sleeping. I love the reply someone's written in. It is probably a comfortable place for homeless people with an attitude. What city was it? wv: terbowli - mispronounced Tivoli? Maybe the tourists were crazy drivers from France or Italy and there were some accidents with pedestrains. I think the sign is from an American roadway. We suppy very few benches for people to even sit down to wait for a bus.